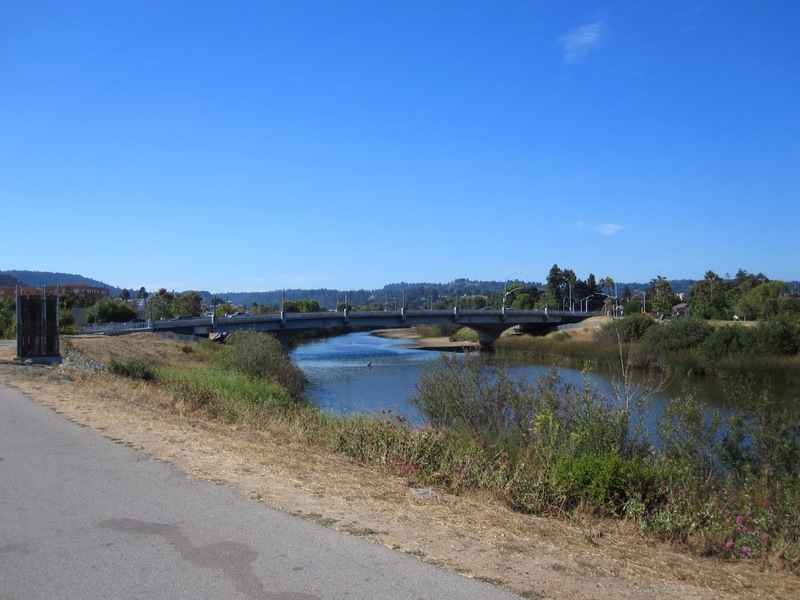 The Laurel Street Bridge (36C0102) is a 3-span bridge with a drop-in center span over the San Lorenzo River. The bridge is 335 ft long with a 170 ft main span and it's 83 ft wide. The bridge is supported on pier walls that have a latticed outside facing which flares dramatically upward to the soffit. This bridge was built in 1968 and got a $5 million seismic retrofit in 1999. The piers and foundations were strengthened, the soil was mitigated to prevent liquefaction, and the bridge was decorated with new lampposts and railings to match the other river crossings. In fact, this bridge looks almost identical to the Water Street Bridge across the San Lorenzo River that we will be visiting shortly. Santa Cruz County, California Bridges: Laurel Street Bridge across the San Lorenzo River by Mark Yashinsky is licensed under a Creative Commons Attribution-NonCommercial-NoDerivatives 4.0 International License.